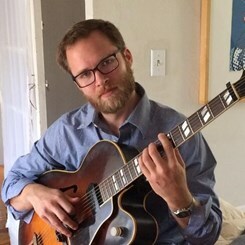 Ethan Reinking is a Maryland native who has over ten years experience playing and teaching guitar. Ethan's fascination with the guitar began at an early age. He was first inspired by classic rock bands, folk, and blues. After being exposed to some albums by Wes Montgomery, Ethan switched his focus to jazz. He enjoys performing regularly in the Baltimore/D.C. area. He has performed in large ensemble settings, small combo settings, and solo. He received an undergraduate degree in Jazz Guitar Performance from The Peabody Conservatory of The Johns Hopkins University. Ethan also teaches banjo and lap-­‐steel guitar. He enjoys sharing his love and excitement for music with his students. Request Lessons with Ethan today!